Get the most from your study time...and experience a realistic USMLE simulation! 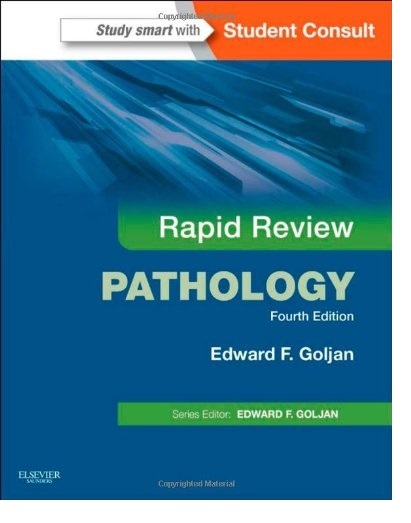 Rapid Review Pathology, by Edward F. Goljan, MD, makes it easy for you to master all of the pathology material covered on the USMLE Step 1. It combines an updated outline-format review of key concepts and hundreds of full-color images and margin notes, PLUS more than 400 USMLE-style online questions! Get all the practice you need to succeed on the USMLE! Review all the information you need to know quickly and easily with a user-friendly, two-color outline format that includes High-Yield Margin Notes and Key Points.Practice for the USMLE with the included access to online USMLE sample questions and full rationales.Profit from the guidance of Dr. Edward Goljan, a well-known author of medical review books, who reviewed and edited every question.Visualize key pathologic concepts and conditions with over 1,000 full-color images, completely reviewed and updated for this new edition.Take a timed or practice USMLE™ test, access rationales for why each answer is right or wrong, and link to other Rapid Review books you have purchased online at www.StudentConsult.com.